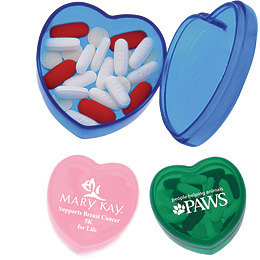 Heart shaped, lightweight pill box suitable for carrying a variety of pills, both large and small. Compact design that fits easily in your pocket or purse. Colour(s): frost, frosted red, frosted blue, frosted aqua, frosted pink, frosted purple, frosted lime, frosted orange, frosted yellow.